Calumet Farm's Flying Scotsman and jockey Flavien Prat win the Grade III, $100,000 Cecil B. DeMille Stakes, Sunday, November 25, 2018 at Del Mar Thoroughbred Club, Del Mar CA. Flavien Prat and Jerry Hollendorfer made it a sweep of Sunday's features as Calumet Farm's talented Flying Scotsman scored impressively as the even-money favorite in the Grade III $100,000 Cecil B. DeMille Stakes for 2-year-olds at Del Mar. After pressing the pace of 2-1 second choice Vantastic, Flying Scotsman took control entering the stretch and drew off with a burst of speed to score by four and one-quarter lengths in a stakes record 1:34.44 for the mile over the infield Jimmy Durante Turf Course. Closing to be second in the field of five juveniles was Rijeka, a half-length in front of Vantastic, with Takeo Squared fourth, another five and one-quarter lengths back. Scratched was Irish Heatwave. Flying Scotsman, a chestnut son of English Channel bred in Kentucky, scored his second win in three starts and paid $4, $2.80 and $2.10 to earn first money of $60,000. Rijeka returned $3.60 and $2.80, while Vantastic paid $2.40 to show. 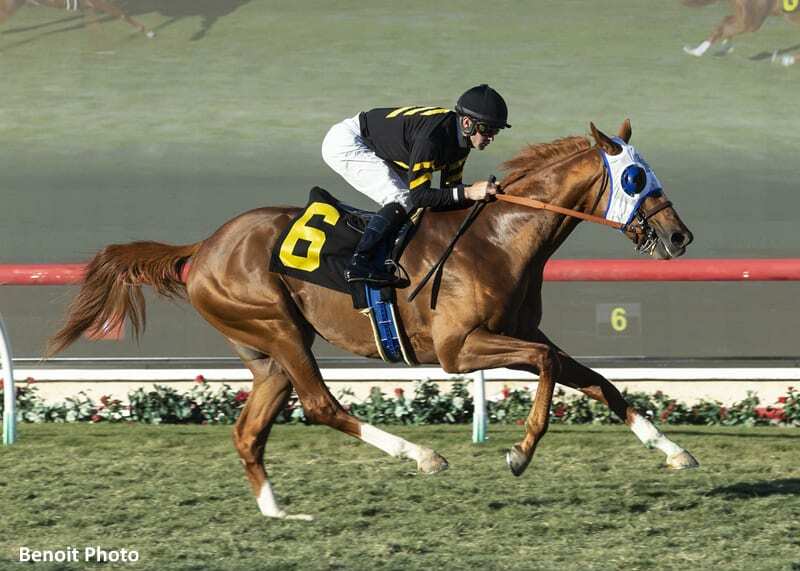 Flying Scotsman completed a training triple for Hollendorfer. In addition to winning the Native Diver with Battle of Midway, the Hall of Fame conditioner also won Sunday's fifth race with Lucky Student. Leading rider Drayden Van Dyke booted in three winners – Perfectly Majestic in the second, Lucky Student in the fifth and two-year-old Qahira, an impressive debut winner for trainer Bob Baffert in the seventh. He leads Prat, 15-13, with four days remaining of the 2018 fall season. This entry was posted in NL List, Racing and tagged cecil b. demille, Del Mar, drayden van dyke, English Channel, flavien prat, flying scotsman, jerry hollendorfer by Del Mar Thoroughbred Club. Bookmark the permalink.